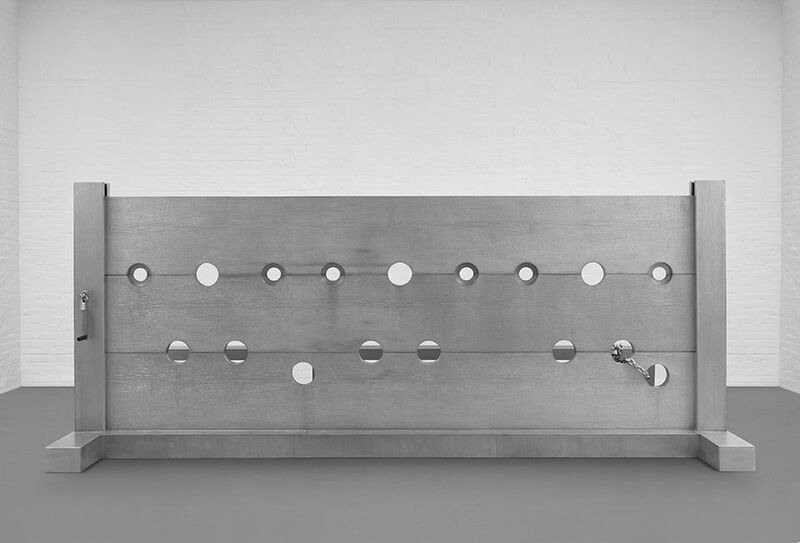 Conceived for the group exhibition Public Information: Desire, Disaster, Document, at the San Francisco Museum of Modern Art in 1995, this cast aluminium structure, punctuated by two horizontal gaps and 16 round holes, may strike at first as a minimalist sculpture. Yet it is Noland’s specific genius to deliver a gut-punch of social critique only after a beat, when one notices the heavy padlock and chain and identifies it as a stockade, heavy with connotations of prisoners and slaves. “There is a method in my work which has taken a pathological trend”, the artist, whose work tackles the more discomfiting aspects of American civic life, told Michèle Cone in a 1990 interview. “I became interested in how, actually, under which circumstances people treat other people like objects.” Noland, whose relationship to her own market has been notably ambivalent, installed the piece in Phillips’ galleries and provided a certificate of authenticity. “The consignors have a good relationship with her and we are very respectful”, says Scott Nussbaum, head of 20th century and contemporary art for the auction house. Noland’s auction record stands at $9.8m, set at Christie’s New York in 2015, for Bluewald (1989). 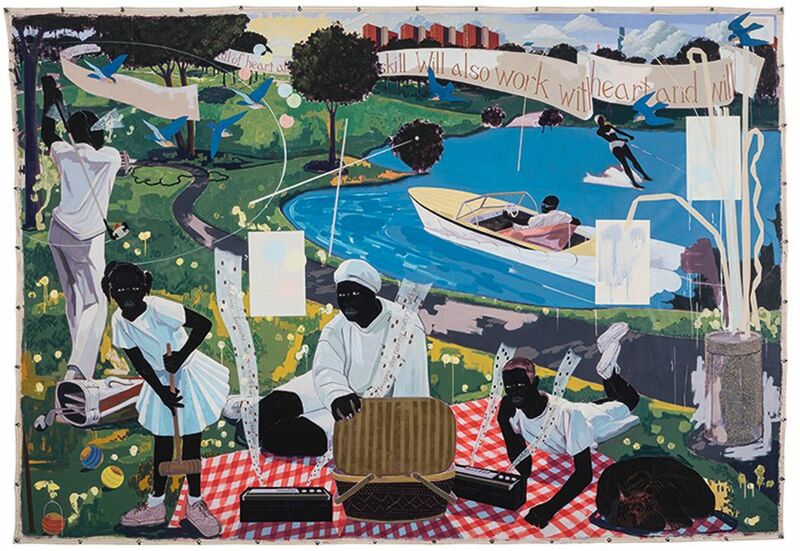 This panoramic acrylic and collage painting by the US artist Kerry James Marshall, described by the auction house as a “masterpiece of unparalleled rigour and graphic grandeur”, shows African American figures inhabiting an idealised Chicago suburb, suggesting the “so-called American Dream [...] long withheld for innumerable black Americans”. The work is the capstone to the artist’s socio-political Garden Project series, made between 1995-97, dealing with the daily lives of African Americans living in urban housing projects, which the artist reimagined as idyllic pastorals. The painting was featured in the Whitney Biennial the year it was executed was mostly recently shown in the mid-career survey co-organised in 2016-17 by the Museum of Contemporary Art, Chicago, the Metropolitan Museum of Art, New York and the Museum of Contemporary Art, Los Angeles. Saara Pritchard, the auction house’s senior specialist of contemporary art, says that the work has “certainly been a favourite in our preview by collectors from around the globe, both institutional and private”. Pritchard adds that no works of “this calibre and scale” have been offered at auction in the last five years. Christie’s New York set Marshall’s record last year with Still Life with Wedding Portrait (2015), which made around $5m (est $1m-$1.5m). 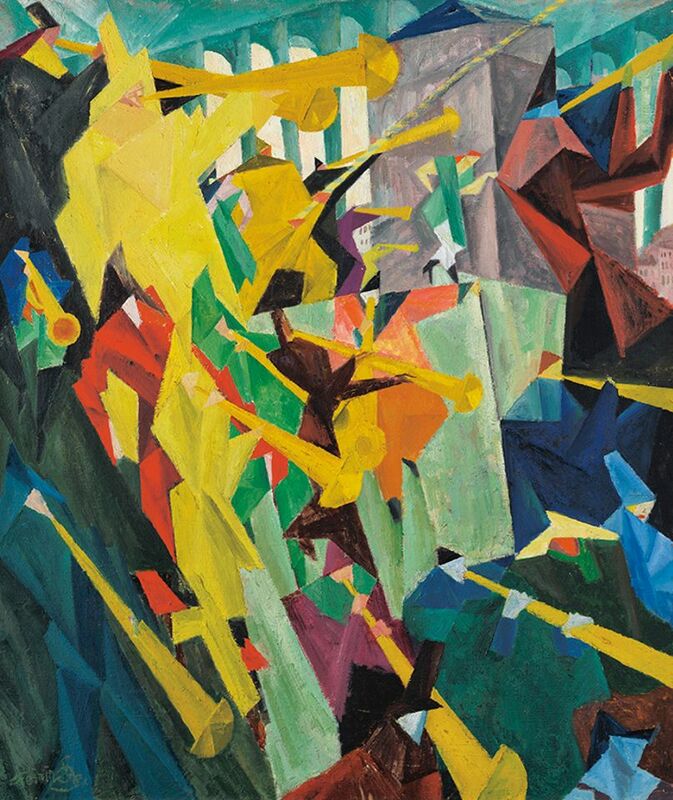 This dynamic and exuberant oil by the German-US artist Lyonel Feininger reflects the influences of both Cubism and Italian Futurism, as well as his early interest in music. Born in New York, Feininger moved to Germany as an illustrator before shifting to fine art, starting with cacophonous street scenes. The large canvas is “one of very few exceptional works from this crucial phase of the artist’s career to appear at auction in the last 20 years”, says Conor Jordan, the auction house’s deputy chairman of Impressionist and Modern art. Jordan adds that the sparsity of Feininger’s works on the market makes it “challenging to assess the exact demand for his work; however, early indications of interest from current collectors suggest that the appetite remains strong”. Sotheby’s New York set the artist’s record in 2007 with a smaller oil painting, Jesuiten III (1915), which achieved $23.3m (est $7m-$9m). The painting has been published extensively and was most recently shown in a retrospective of the artist’s work at the Whitney Museum of American Art in 2011.